35 Cards. Continue collecting the classic 1970 Topps Baseball design and complete your set! Find spectacular rookie call-ups and traded veteran players. Once again, major highlights of Heritage High Numbers include Real One Autographs, Clubhouse Collection Autograph Relics and much more!! RETAIL EXCLUSIVE – 1970 TOPPS PLAYER STORY BOOKLETS – Replicating the 1970 Topps Player Story Booklets and featuring top veteran and rookie players! Real One – Retired and active players sign ON-CARD autographs in blue ink. Select cards will feature players that appeared for the last time on a Topps card in 1970. Real One Special Edition – Signed in red ink, hand-numbered to 70 or less. 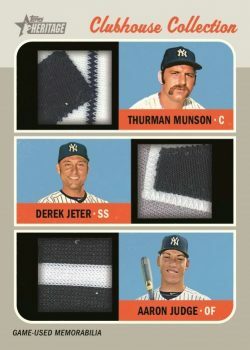 Clubhouse Collection Autograph Relics – Uniform and bat relic cards to be signed ON-CARD by active and retired players. Hand numbered to 25 or less. 1970 Baseball Cut Signatures – Featuring players who made the news in 1970, #’d 1-of-1. 1970 Celebrity Cut Signatures – Featuring musicians and celebrities that were popular in 1970, #’d 1-of-1. Clubhouse Collection Single (w/ Gold Parallel #’d to 99), Dual (#’d /70), Triple (#’d /25), Quad (#’d /10). Rookie Performers – Top rookie players not captured in the first Heritage set. Now and Then – Highlights from the 2018 season and connections to 1970. Award Winners – Cards featuring the biggest awards in MLB and the corrsponding winner. 1970 Topps Player Story Booklets – Replicating the 1970 Topps Player Story Booklets. Highlighting top verteran and rookie players – RETAIL EXCLUSIVE! Base Set – 200 cards, showcasing 200 veterans and rookie players who did not appear in Heritage. Collect all 25 High-Numbered Short-Printed cards! Chrome Parallels: Refractor #’d to 570, Black-Bordered #’d to 70, SuperFractor #’d 1/1, Chrome HOT BOX Refractor VALUE BOXES ONLY!